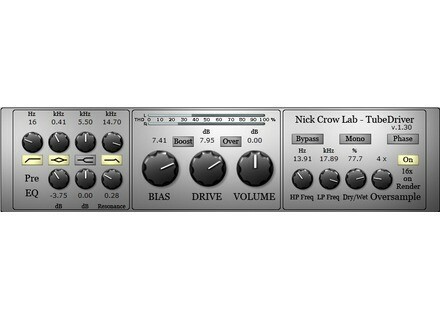 TubeDriver, Software Amp Simulator from Nick Crow Lab. The TubeDriver v1.3 update adds a global dry/wet control and a Total Harmonic Distortion (THD) level meter. You can update the freeware at sites.google.com/site/nickcrowlab/. De la Mancha Sixtyfive compressor is now free De la Mancha announces that Sixtyfive, a dbx 165A-style compressor VST plug-in for Windows, is now available as a freeware. Fairchild and Maag join the UA plug-in collection Universal Audio launched a new update that brings Fairchild Tube Limiter Collection and Mag EQ4 plug-ins to the UA software.